Celebrating the life of Roscoe Roberts, Sr.
Obituary for Roscoe Roberts, Sr.
Roscoe Roberts, Sr. was born on November 19, 1920 in Jones, Oklahoma to the union of Samuel Roberts, Sr. and Alberta Witfield. He grew up in the small town with his parents and two siblings. Roscoe attended Douglas High School in El Paso, Texas later graduating from Wasco High School in Wasco, California. While in high school he excelled at sports; particularly, track and field, proudly lettering in the sport. He accepted Christ at a young age, and became a member of Second Baptist Church where he was baptized on November 25, 1945. While in El Paso he met Christin Kyser. They married on September 10, 1942 and to this union five children were born; Alberta, Marilyn Joyce, Gloria, Helen Ruth and Roscoe Roberts, Jr. Shortly, after being married Roscoe was drafted into the United States Army on November 30, 1942 where he served until October 28, 1945. In December 1945, racial barriers were broken and he was one of the many African American men who integrated the El Paso Police Force. He was the second African American police officer hired. He was given the name, “Ground Pounder” because he walked the “beat”. After residing in El Paso for many years Roscoe and Christine, along with their children, moved to Denver, Colorado in 1960. After many years employed by the Denver Federal Center, he retired. He became a member of Macedonia Baptist Church where he faithfully served on the Deacon Board and was the Director of the Baptist Training Union. He organized the Tape Ministry and was a devoted Bible Study attendee. He later joined Ebenezer Baptist Church serving on their Deacon Board. Deacon Roscoe Roberts was an Ebenezer Baptist Church ‘2017 Honoree’ as one of the oldest members. To his aunts, uncles and immediate family he was affectionately known as “Doc’ and to his grandchildren he was known as “Pa”. he was a loving devoted husband, father, brother, uncle, grandfather, great-grandfather, great-great grandfather and friend. He will be missed and lovingly remembered. 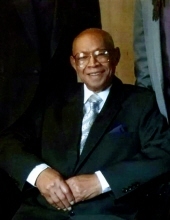 He was preceded in death by his wife, Christine (Kyser) Roberts; his parents, Samuel Roberts, Sr., Alberta (Whitfield) Martin and James Cleveland Martin (step-father); two daughters, Alberta (Roberts) Collier and Gloria Roberts; brother, Samuel Roberts, Jr. and sister, Leola Bea (Roberts) Rivers. Brothers-in-law, Charles Woodard of Denver, CO and Charlie James Kyser of Fort Worth, TX; sisters-in-law, Barbara J. Gooch (Myron)and Billie J. Richmond of Denver, CO and a host of nephews, nieces, other relatives and friends. To send flowers or a remembrance gift to the family of Roscoe Roberts, Sr., please visit our Tribute Store. "Email Address" would like to share the life celebration of Roscoe Roberts, Sr.. Click on the "link" to go to share a favorite memory or leave a condolence message for the family.